The beauty of Zion National Park reaches beyond the park's boundary where eerie crags nest in the lofty tops of the Vermillion Cliffs. The Eagle Crags Trail begins at the end of a dirt road where the tiny town of Rockville gives way to BLM land and towers of misshapen rock. Ever present are the juniper forests that spread through the parched environment. Thirsty trees horde scarce moisture all the while soaking up the abundant sunshine along the 5-mile, round-trip route that runs along a wide sandy path winding through a labyrinth of desert vegetation. A gentle ascent dominates most of the way; however, a few sections near the end are steep. Sturdy hiking shoes or boots will help prevent slipping and injury along the more difficult portions of the trek. Equipment: Wear appropriate clothing for the weather and be sure to take emergency supplies. Sturdy hiking shoes are recommended. Be sure to carry at least 2 - 3 quarts of water for each person. Difficulty: Moderate. An easier trail until the final sections of the trail gain elevation. Permits: Not required. This trail is outside of Zion National Park on BLM land. Trail Conditions: A wide sandy path strewn with rocks. The trail is in full sun on the arid, hot side of Zion National Park. This is not an ideal hike in the heat of summer. The trail is often used by horseback riders. This is a good path for trail runners. Equip your 4WD with a spare tire and jack. The trailhead is in a remote area. Bring extra water. Trailhead: Rockville - South of the south entrance to Zion National Park. Trail Access: It's best to use a high clearance 4WD. The road can be Impassable if wet. Best Season: This is a good winter hike. The best time to do this hike is in the spring, fall and winter. Summer months will be hot, however an early morning start can be cooler. The jagged spires in the Vermillion Cliffs above Rockville are the target for this moderately difficult winter trail. A high clearance 4WD vehicle is recommended, but even with one the road may be impassible when wet. 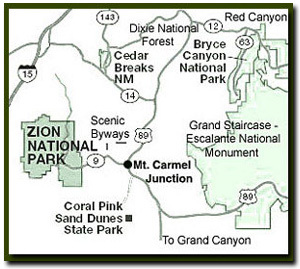 Make your way to Rockville, which is located on the south side of Zion, just past Springdale, where this route begins. Once in town, turn south on Bridge Road, set your trip-meter and drive south across the old bridge spanning the Virgin River. It's only a short distance before the paved road makes a hard right turn, but to reach your destination go straight on the dirt road rather than turning right. You will climb a steep grade before traversing up to the head of a large bowl. A mile from SR-9 there is a three-way intersection where you need to drive straight instead of turning. Drive past the dwellings on both the right and left as you begin the short, rocky uphill climb to yet another junction. Turn left at the intersection and pass over the wash climbing up the hillside and bearing northeast. At 1.9 miles there is a small pullout on the right and a narrow ATV path doubling back to it. This is where you will leave your vehicle. On the southeast edge of the parking area should be the BLM trailhead sign, however, it is often vandalized and missing, so don't count on it always being there. The route bears to the southeast for the first half-mile as it slowly traverses and descends into the wash below. Where there is then a gradual ascent, still headed southeast, up the opposite side of the drainage. You begin a gradual climb to the southeast, exposing views of the massive "laccolith" Pine Valley Mountain to the west and the main canyon of Zion to the north. The outcrop of sandstone known as Eagle Crags appears to grow in elevation as each step draws you closer to the base of the towering, magnificent pinnacles. You will pass through a hikers gate as the trail follows a ridge to the south and a mile farther the path heads in an easterly direction. You will see wonderful views of the Parunuweap basin unfold to the northeast, and a large private reservoir can be seen below to the east in the South Creek drainage. Hiking becomes harder here as elevation increases and you switchback up and toward the eastern tip of the crags. After some huffing and puffing, you will make it to the top of a ridge and the end of the 2.5 mile route. The views to the south show the slickrock cliffs that rim Lower Mountain. Beyond the ridge, the beaten path becomes faint and difficult to follow. This is where most people will stop and turn around. Past this point is the "Old Cattle Trail" which had been used by cowboys to move cattle to Lower Mountain, Canaan Mountain and the old Sawmill on top. For the backpacker this route is the end of one of the two authors favorite trails, which begins in Hildale, traveling through Water Canyon, up Canaan Mountain and exiting here. The Eagle Crags themselves are a ridge of the Vermillion Cliffs extending north of Lower Mountain sitting on the plateau of Canaan Mountain. There is ample space and a level area at the end of this trail to settle back for a nice picnic so you can relax and prepare for the downhill hike back to your vehicle. If you are lucky you might even see a climber scaling the sheer stone making their way to the top of the crag along the climbing route known as Mrs. Butterworth. While resting, see if you can spot the historic Shunesburg settlement in the distance and the slickrock plateau of Canaan Mountain. You will also be able to see various peaks extending to the skyline including: Shunesburg Mountain, Johnson Mountain, De Mille Peak and Zion's Watchman, Mount Kinesava and West Temple. Backpacking Option - Past the end of this trail is the "Old Cattle Trail which was once used by cowboys to move cattle to and from Lower Mountain, Canaan Mountain and access the old sawmill on top. 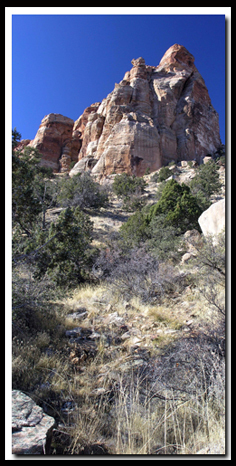 For the backpacker this route is the end of the authors favorite trails, which begins in Hildale, Arizona , travels through Water Canyon, up canaan Mountain and exits here.